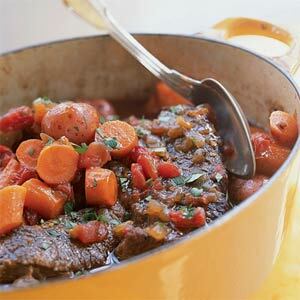 Easy Pot Roast in a pot! In a large “cast iron dutch oven” pot, heat the EVOO and then add onions and sauté until golden brown. Dredge the pot roast in flour and cover all parts and then add floured roast to pot and brown on all sides. Do not worry about onions burning…it is ok! When the meat is falling apart and the carrots, celery and potatoes are cooked remove for the pot and set aside. Take the butter and the flour and “knead” it together into a ball and then break it apart and add to the broth and stir until thickened. Then I added everything back to the pot and heated and then put into soup bowls and served with a hearty warm bread. Or, you can put the sauce in a gravy boat and serve the meat, veggies and then cover with the sauce. The choice is yours!! !